Can I just say how strange it is to move from the academic world back to a world where you need to promote your show? Anyway, please see below for details. Come to the show! 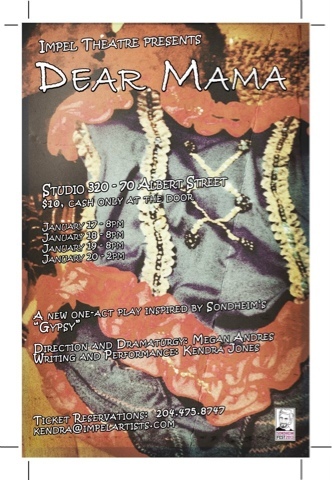 Impel Theatre proudly present Dear Mama, a new one-act play in response to Sondheim, Gypsy, lost childhood, and stage mothers around the world. "Not everyone is capable of being loved, Ruby. They are too selfish. They aren't willing to give themselves to the people who want to love them." Inspired by Sondheim's lyrics in Gypsy, this new piece delves into the mind and body of a girl obsessed with fame, beauty and attention. Words have the power to build you up or tear you down. "Beautiful. I'm beautiful. Look, Mama, I'm beautiful." Mama will be proud. Each performance will be followed by a 30-minute Q & A session with the creative team. Note that seating is limited to 35 per performance.